With my vast experience of raising children under the age of five (well two of them anyway!) – one of the things I say is well worth investing in is a good cubby house. They provide hours of endless play and are a child’s own space to use as they wish. I particularly like this one because they can make it their own. 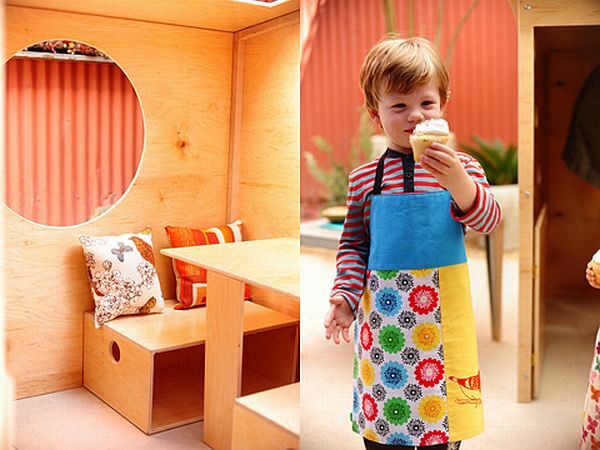 The Modern Playhouse is designed as a blank canvas for your little one to stamp their personality on. This might be in the form of simply painting it or there’s a range of accessories to add including furniture and textiles. The brainchild of San Francisco designers Gitane Royce and Nisreen Witt, the basic house comes in two models – the wedge or the circle. They are handcrafted to order from sustainable wood and come flat-packed ready to be assembled (instructions are included!). Each house costs US$1250 direct from Modern Playhouse, although you will need a reshipper as direct shipping to Australia is not yet available. I have to say that at nearly sixty kilos, sending the house here is likely to be pricey but the whole range of accessories is well worth a look. I love the gorgeous bunting and the brightly designed cushions are beautiful. At US$35 and US$40, these are a bit less expensive and a lot lighter to ship!